As volcanic ash spreads from an eruption under a glacier in the Eyjafjallajokull region of Iceland, the British have taken the drastic step of locking down the country's airspace. Here's why. The world's bustling air traffic corridors pass over hundreds of volcanoes just like the one in Iceland — all of which are capable of sudden, explosive eruptions of fire and ash. In the United States alone, aircraft carry many thousands of passengers and millions of dollars of cargo over volcanoes each day. As we see today, volcanic ash can be a serious hazard to aviation even thousands of miles from an eruption. Airborne ash can diminish visibility, damage flight control systems, and most importantly, cause jet engines to fail. In fact, according to Boeing public relations officials, in the past 30 years, more than 90 jet-powered commercial airplanes have encountered clouds of volcanic ash and suffered damage as a result. Here's an example of one such case. On December 15, 1989, clouds of ash from an eruption at Mt. Redoubt Volcano in Alaska nearly caused a Boeing 747 jetliner (KLM Flight 867) carrying 231 passengers to crash land after losing power to all four engines. As the crew of KLM Flight 867 struggled to restart the plane's engines, "smoke" and a strong odor of sulfur filled the cockpit and cabin. For five long minutes the powerless 747 jetliner, bound for Anchorage, Alaska, with 231 terrified passengers aboard, fell in silence toward the rugged, snow-covered Talkeetna Mountains (7,000 to 11,000 feet high). All four engines had flamed out when the aircraft inadvertently entered a cloud of ash blown from erupting Redoubt Volcano, 150 miles away. The volcano had begun erupting 10 hours earlier on that morning of December 15, 1989. Only after the crippled jet had dropped from an altitude of 27,900 feet to 13,300 feet (a fall of more than 2 miles) was the crew able to restart all engines and land the plane safely at Anchorage. The plane required $80 million in repairs, including the replacement of all four damaged engines. It's a process that's sort of like Mother Nature's version of a "Cash for Clunkers" engine getting killed. Volcanic ash normally contains glassy materials, such as silicates, whose melting points are 600 degrees Celsius to 800 degrees Celsius. 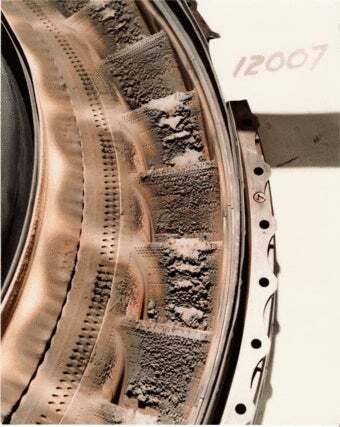 Since internal temperature of in-flight jet engine exceed 1000 degrees Celsius, glassy particles in volcanic ash inhaled by the engines instantly melt. In the course of exhaust, the glassy materials are rapidly cooled down in the turbine chamber, stick on the turbine vanes, and disturb the flow of high-pressure combustion gases. 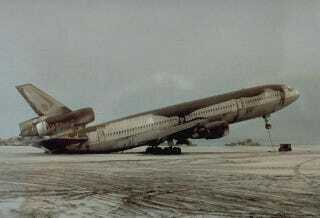 This disorder of the flow may stop the entire engine in serious cases — such as KLM Flight 867. Such dangerous and costly encounters between aircraft and volcanic ash can happen because ash clouds are difficult to distinguish from ordinary clouds, both visually and on radar. Also, ash clouds can drift great distances from their source. For example, in less than 3 days, the ash cloud from the June 15, 1991, eruption of Mount Pinatubo in the Philippines traveled more than 5,000 miles to the east coast of Africa. This ash cloud damaged more than 20 aircraft — including the DC-10 shown above — most of which were flying more than 600 miles from the volcano. So today's decision by British aviation officials to clear UK airspace until at least 1:00 am EST on Friday, while difficult, makes a heck of a lot of sense.